One of the final duties for Quinte Secondary School Principal Liane Woodley will be a presentation of the proceeds from the ‘Weekend to Remember’ event to the Chair and Executive Director of The Hastings and Prince Edward Learning Foundation. The purpose of The Learning Foundation is to fundraise for programs and services that help students overcome barriers and help them succeed in school. Quinte Secondary School has a long history of giving back to the community so it was not surprise that, even with the school closing – Quinte found a way to give. Organizers of the Closing Ceremony – A Weekend to Remember, made the decision to host a silent auction to sell all of the trophies, banners and other achievement awards to ensure that the history of Quinte Secondary School would live on in the homes of QSS Alumni. All funds from the auction would be donated to the Learning Foundation to support students and families in our community. It was amazing to see the excitement of winners of the silent auction. Dr. Henry Kafka was one of these lucky winners who won the Ontario Scholar board that has his name, his wife’s name and the name of a close friend who recently passed away. We were very excited to raise $8000.00 for the Learning Foundation. Susan Sweet, Chair of The Foundation notes that the generous donation, “Will help to ensure that all students have the support needed to realize well-being and success.” Specifically, the donation will benefit the Student Emergency Fund. This school year 455 Student Emergency Fund Requests were received, and that’s almost 100 more requests then were received the 2016/17 school year. 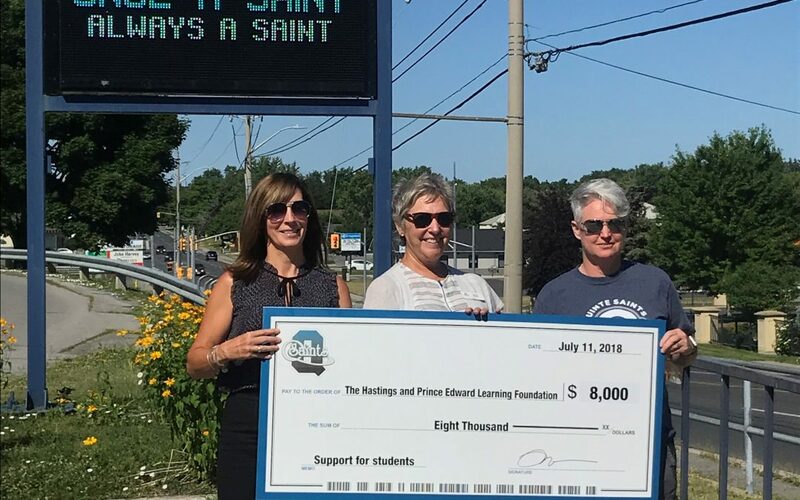 The support received over the years from Quinte Secondary School staff, students, and school community, has been greatly appreciated by The Learning Foundation.